April 6, 2010 - The Department of Transportation’s (DOT) Office of Inspector General issued their report on the Federal Aviation Administration’s (FAA's) policies and procedures for screening, placing, and initially training newly hired air traffic controllers. DOT found that the FAA’s process for selecting and placing new controllers does not sufficiently evaluate candidates’ aptitudes because the FAA does not effectively use screening test results or consider candidates’ FAA Academy performance to help determine facility placement. DOT conducted this review at the request of the Chairman of the House Subcommittee on Aviation. Their audit objectives were to: (1) evaluate how FAA determines whether candidates have the requisite abilities to become successful controllers; (2) determine what procedures FAA uses to place controllers at air traffic facilities; and (3) assess whether the initial training provided by the FAA Academy adequately prepares new controllers for facility on-the-job training. As a result, new controller candidates, many of which have no prior air traffic control experience are being assigned to some of the busiest air traffic control facilities with little consideration of whether they have the knowledge, skills, and abilities necessary to become certified controllers at those locations. In addition, facility managers that DOT spoke with stated that candidates arrive after passing Academy training unprepared to begin facility training, indicating the need to restructure FAA’s testing and training procedures. DOT recommended that FAA evaluate and redesign its current screening test to consider candidates’ skill sets, assign candidates to a facility based on their Academy performance, and improve its Academy training program by implementing the recommendations of FAA’s 2007 Controller Training and Development Group. The FAA partially concurred but proposed acceptable corrective actions to all of DOT recommendations. Background; after the 1981 controller strike, FAA screened candidates primarily using a 9-week training course taught at the FAA Academy. The program proved highly effective at identifying candidates’ potential abilities—with only a 57-percent pass rate for the 27,925 controller candidates screened between 1981 and 1992. However, this process was expensive, costing about $20,000 per candidate, so the FAA began developing AT-SAT in the 1990s to achieve a less costly and more streamlined screening tool to identify candidates with the best controller aptitudes. • Screening: AT-SAT consists of an 8-hour series of aptitude tests. Controller candidates with no previous air traffic control experience and those who have graduated from a Collegiate Training Initiative program are screened using AT-SAT.1Candidates must score at least 70 percent on the exam to be considered for employment. Controller candidates with prior air traffic control experience, such as ex-military controllers, are exempt from taking AT-SAT. • Placement: After completing screening, new candidates are assigned to a facility location. This is done by creating a list of facility vacancies and eligible applicants. A group of air traffic facility managers then meets at least once a quarter and attempts to match the assignment preference of each candidate to the needs of specific air traffic control facilities. Air traffic control facilities are categorized by levels (4 through 12) based on the complexity and number of operations. Level 4 facilities are the least complex while Level 12 are the most complex. Controllers’ base salaries are determined by the level of the air traffic control facility to which they are assigned. • Initial Training: Before they begin training at their assigned facilities, most new controllers must complete 2 to 3 months of initial training at the FAA Academy. This training consists of lectures and simulation problems in basic air traffic control concepts and procedures. Upon completion of these courses, the candidate must then pass the Performance Verification, or PV. This is a final examination of learned knowledge and skills using simulators and is overseen by current operations supervisors from selected air traffic facilities. The FAA does not use AT-SAT results to determine the level of facility in which new controllers are placed even though the number of inexperienced controller candidates being hired and screened by AT-SAT is increasing. For example, the number of new hires with no prior air traffic control experience increased from 7 percent of those hired in fiscal year (FY) 2007 to approximately 72 percent during the first half of FY 2009. This has resulted in an increase of inexperienced controllers being assigned to high level air traffic control facilities. 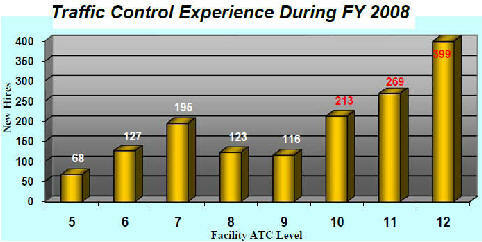 In FY 2008, 58 percent (881 of 1510) of all newly hired controllers with no prior air traffic control experience were placed at Level 10 through 12 facilities (the busiest and most complex in the Nation). These include facilities such as the Southern California Terminal Radar Approach Control and the Chicago O’Hare and Atlanta Hartsfield Air Traffic Control Towers.